Is your job search a search headache? 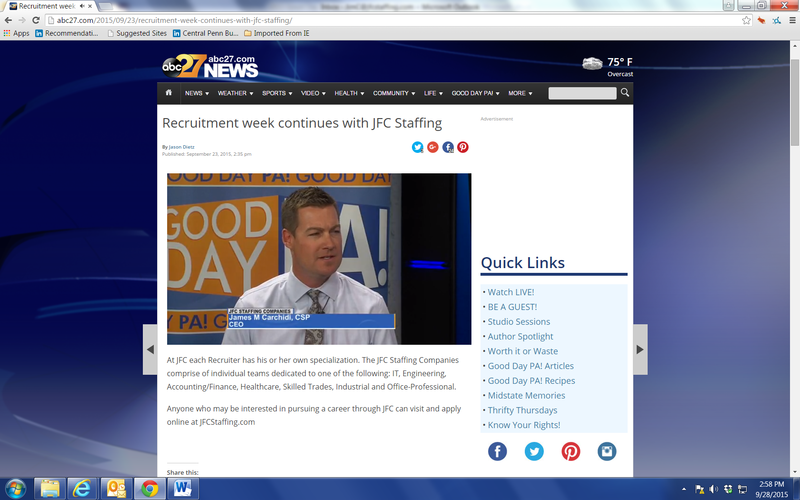 Let the team of JFC Recruiters be your extra set of eyes and ears. Think of us like sports agents but instead of representing the best athletes we represent the best talent – like YOU! Time is your most precious commodity, and once gone it can never be gotten back. Quit wasting your time waiting for employers to respond and let us connect you to that next job! At JFC each Recruiter has his or her own specialization. The JFC Staffing Companies comprise of individual teams dedicated to one of the following: IT, Engineering, Accounting/Finance, Healthcare, Skilled Trades, Industrial and Office-Professional. For more information about each of our specialties please visit our website.